Are Raisins Bad for a Diet? Raisins are among the most commonly eaten dried fruits. Their energy-dense nutritional profile has distinctive health benefits, and raisins should be part of your well-balanced diet. Raisins contain polyphenols, antioxidants and important micronutrients that aid digestion, boost iron levels and keep your bones strong. Raisins are naturally sweet and high in sugar content and calories. They can, however, be a part of your weight-loss diet if you don't eat too many. Raisins are high in calories — 129 in a small-box serving of 1.5 ounces. Of the calories in raisins, 95 percent are carbohydrates. Good-quality carbs are a fundamental part of many successful dieting plans, such as the Pritikin Program. The carbs in raisins contain important dietary fiber that is actually beneficial to weight management. Compared to a high-fat snack with added sugar, a small box of raisins is a healthier option offering all the nutrients of fresh grapes in a concentrated form. Raisins contribute high fiber to slow digestion, a low to moderate glycemic index to help control blood sugar spikes, and an overall sweetness and chewiness that offer oral and sensory satiety that may help control your appetite. A research article published by the International Journal of Food Sciences and Nutrition in 2019 suggests that drinking water with your dried fruit will increase the volume in your stomach and create the feeling of fullness that could deter overeating and weight gain. 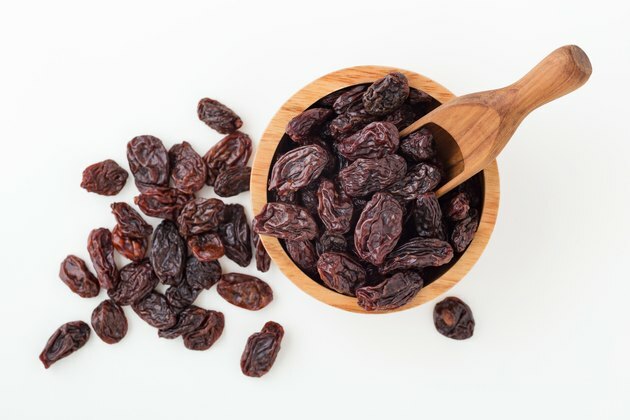 Evidence from a study published in Food and Nutrition Research in 2017 recommends raisin consumption for a healthier lifestyle in terms of better nutrient intake, diet quality, weight parameters and lowered risk of obesity, often linked to many health risks. The study compared people who don't eat raisins to participants who ate raisins. Findings were that the raisin eaters had a 9 percent higher intake of energy, 34 percent increase in dietary fiber, 16 percent increase in potassium, 22 percent increase in both magnesium and vitamin E, and a 24 percent increase in vitamin C. In addition, raisin consumers had 17 percent lower intake of added sugar, 15 percent less saturated fat and 10 percent less sodium. Conclusions of the examination were that people who ate raisins had lower body weight, body mass index and waist circumference. Raisin eaters were reported less likely to be overweight or obese and had a 54 percent reduced risk of metabolic syndrome, the marker for chronic heart disease. Raisins have a high fiber content with 3.7 grams in a 1.5-ounce box. Dietary fiber keeps your digestive system functioning properly by adding bulk to food to help it move through your stomach, intestines and out of your body. By helping to keep you regular, fiber in raisins helps prevent constipation, irritable bowel syndrome, diverticulitis and other gastrointestinal disorders. A high-fiber diet may help reduce the risk of heart disease, obesity and diabetes, says Mayo Clinic. In addition, a high-fiber intake helps increase stool weight, which may be one of the contributing factors for reducing the incidence of colorectal cancer, according to a 2019 study published in the International Journal of Food Sciences and Nutrition. Data from the cohort study suggest that 7 grams of additional fiber per day is associated with an 8 percent reduction in colorectal cancer risk. In another large-scale Nurses Health study, published by Pediatrics in 2016, dietary fiber was associated with significantly lowering the risk of breast cancer. Evidence suggested that eating more fiber during adolescence may provide protection in adulthood. If you're an athlete or bodybuilder, the healthy carbs in raisins can provide you with the energy needed for a longer, harder workout. As you exercise, your body starts to deplete glucose levels in your blood, using glycogen instead, which are carbohydrates stored in your liver and muscle tissue. Raisins have a high carb-to-protein ratio —34 grams of carbs to 1.3 grams of protein per 1.5 ounces — making them an ideal snack to replenish muscle glycogen required to fuel your muscles and boost your energy. The iron found in raisins can also help improve athletic performance. Raisins contain a considerable amount — 4 percent of your daily value (DV) per serving. Your cells need iron to turn food into energy and deliver oxygen to your muscles and tissues throughout your body. Iron deficiency, especially with anemia, may reduce your performance because of fatigue and limited ability to exercise or be active, says the National Institutes of Health. Raisins are packed with vitamins. ­­­In just one small box, raisins contain many B vitamins required for various metabolic and physiological functions in your body. Raisins supply 3 percent DV per 1.5 ounces for thiamine, which is needed for the proper functioning of your nervous system, muscles and heart. Supplying 4 percent DV per box for vitamin B6, raisins are good for the health of your eyes, heart and brain. Riboflavin helps metabolize carbs, fats and protein in your body, and a serving of raisins provides 4 percent DV per serving. A 1.5-ounce box of raisins contains 2 percent DV for niacin, which helps your digestive system, skin and nervous system function properly. Other vitamins in raisins include the antioxidants vitamins K and C.
High blood pressure, known as hypertension, can damage your blood vessels, heart and kidneys. This can lead to a heart attack, stroke or other heart problems. Raisins contain minerals — potassium, calcium and magnesium — that are major contributors to proper blood pressure management by your body. Potassium is important for muscle function, including the relaxation of the walls of your blood vessels. This helps to lower or regulate blood pressure. The potassium in raisins also protects against irregular heartbeat by managing the conduction and transmission of electrical signals in your nervous system and heart, says Harvard Health Publishing. Raisins provide 21.5 milligrams of calcium or 2 percent DV per box. Calcium is a vital mineral that's needed, not only for healthy bones, but to help your blood clot and your heart function properly. Calcium aids in muscle contraction, which is important for healthy blood pressure by helping blood vessels tighten and relax when they need to. Magnesium in raisins is another important mineral that helps with muscle and nerve function. Raisins provide 3 percent DV or 13.6 milligrams per 1.5-ounce serving. Magnesium helps blood vessels relax and keeps blood sugar under control. It also helps with the transport of calcium and potassium that contributes to maintaining regular blood pressure. The calcium in raisins is vital to the health of your teeth by strengthening and mineralizing tooth enamel. Raisins consist mainly of fructose and glucose types of sugar — not sucrose, like table sugar, one of the main culprits of oral diseases. Eating raisins could reduce some risk factors for developing oral decay. Researchers have found that phytochemicals in raisins may help kill cavity-causing plaque bacteria associated with gum disease. Raisins in Human Health: A Review identified one of the antimicrobial polyphenol compounds in raisins as oleanolic acid. Oleanolic acid has the ability to suppress the oral pathogens streptococcus and gingivalis, both associated with periodontal disease. A number of minerals in raisins are important for your bones, namely calcium, magnesium and potassium. With 99 percent of your body's calcium supply stored in your bones and teeth, your entire skeletal structure depends on this mineral for bone strength, formation and growth. If you're a postmenopausal woman, raisins are a good option for snacking because their calcium content helps prevent the development of osteopenia or osteoporosis, a disorder characterized by porous and fragile bones and low bone mass. The magnesium in raisins is also helpful for bone health. About 50 to 60 percent of the magnesium in your body resides in your bones, so a diet high in magnesium is shown to increase bone density, which is a measure of bone strength, says NIH. The potassium in raisins — 322 milligrams or 7 percent DV per 1.5 ounces — helps bones by increasing mineral density. A deficiency of potassium can cause a depletion of calcium in your bones, according to the National Institutes of Health. Your body also needs potassium for proper kidney and heart function, muscle contraction and nerve transmission. Snacking on a box of raisins also supplies phosphorus, another bone-friendly mineral. With 85 percent of your body's phosphorus found in your bones as calcium phosphate, phosphorus plays a vital role in bone health. Raisins contain other nutrients, including copper, iron and zinc, that benefit the health of your bones, according to American Bone Health. Read more: Can You Eat Too Many Raisins? Pritikin: What Are Good Carbs? International Journal of Food Sciences and Nutrition: Dried Fruit and Public Health – What Does the Evidence Tell Us?